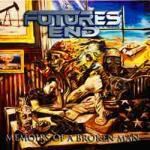 FUTURES END - Terrors of War - LIVE! Progpower USA X Showcase! Copyright(C) 2006 Ｔ＆Ｔ(仮)メタルニュース All Rights Reserved.